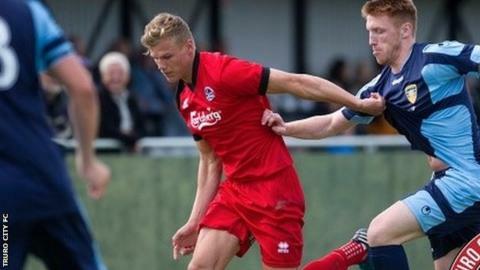 Truro City manager Steve Tully says striker Cody Cooke is capable of getting 20 goals this season. Cooke to become the club's top-scorer in the Southern Premier League this season. "The last two or three games he's been on fire - every time the ball goes to him things are happening," Tully told BBC Radio Cornwall. "I'll be very surprised if Cody doesn't score 15 to 20 goals this season." Tully added: "He's learning the role a bit more and he's going to score goals." City go into their away trip to Corby Town on a high after winning 3-1 at Bideford on Monday to register seven points from a possible nine on the road. "We go there with real confidence," Tully said. "We've got a real sturdiness about us that even if we concede a goal we know how to get back into teams. "We've got the physicality about ourselves and we've got goals in us. If we can keep the scores down we'll definitely be in the game."